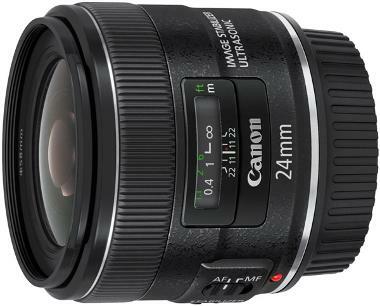 The Canon EF 24mm f/2.8 IS USM is a compact and light-weight wide-angle lens. It is equipped with image stabilization which allows you to shoot at 4 shutter stops slower. This is ideal for shooting both photo and video. A 7-blade circular aperture diaphragm allows for beautiful bokeh and soft background effects. The lens also features fast and silent auto focusing-ideal for recording video.